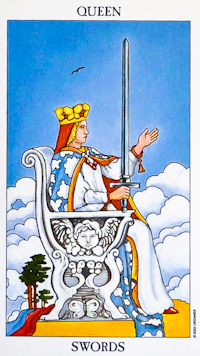 The Queen of Swords sits high on her throne with a stern look on her face indicating that no-one can fool her. In her right hand, she comfortably holds a sword pointed to the sky, and her left hand extends as if she has something to offer to others. Behind her is a spring sky, different from the winter settings on most other Swords cards, and this has an emergence and growth quality to it. The sky is clear, representing her clarity of mind as she considers matters of the intellect. The bird above her head symbolizes the mind’s ability to soar above day-to-day issues in order to arrive at appropriate solutions. The Queen of Swords she has a mature intellect which is devoid of emotion. In mythology, the feminine is associated with emotion but here she acts without much feeling. This card therefore represents the intellect’s ability to judge and discern impartially, without the influence of emotion or sentimentality. This tarot card represents the reason over the emotion. Do not let emotion or empathy get in the way. Rather, use fact and logic to make your decisions. The Queen of Swords also has an innate ability to tell it like it is – She is a quick thinker and highly perceptive – she gets straight to the point. She is upfront and honest about her opinions, and expects the same from others. She communicates her thoughts and opinions concisely and honestly.